If there's any justice in the world, Sylvain Chomet will be handed the Animated Feature Oscar in February for this fantastic little film. It follows none of the rules (see every Disney cartoon feature ever made) and forges an all new narrative and visual style that's so winning it lingers in the mind long after the credits roll (and stay to the end for a punchline). The story centres on the diminutive Madame Souza, living alone with her chubby grandson who she tries to interest with all sorts of hobbies. She even buys him a faithful dog buddy Bruno (who becomes the perspective through whom we see the story). Eventually the boy develops a passion for bicycling, and becomes a tall, lean champion training for the Tour de France. But while racing he's kidnapped by a sinister Mafioso and taken to the big city Belleville, where Madame Souza and Bruno try to rescue him with the help of three has-been hags, triplets who used to be famous vaudeville singers. With hardly any dialog, the film will never need subtitles or translation as it works perfectly to tell a story about love, loyalty and obsession. The stroke of brilliance is to put Bruno the dog at the centre, because she (yes, she) is so completely and utterly endearing that you can never get enough of her. Like a loveable old hound, she's always distracted by something, and she thinks (and dreams) of little besides food. Meanwhile the boy's zombie-like existence is more than a little disturbing, as is Madame Souza's ruthless inventiveness, the way the Mafioso and his henchmen merge into one, and the triplets' diet of frogs. The film is jammed with little touches that are hysterically funny, moving and surprisingly telling too. 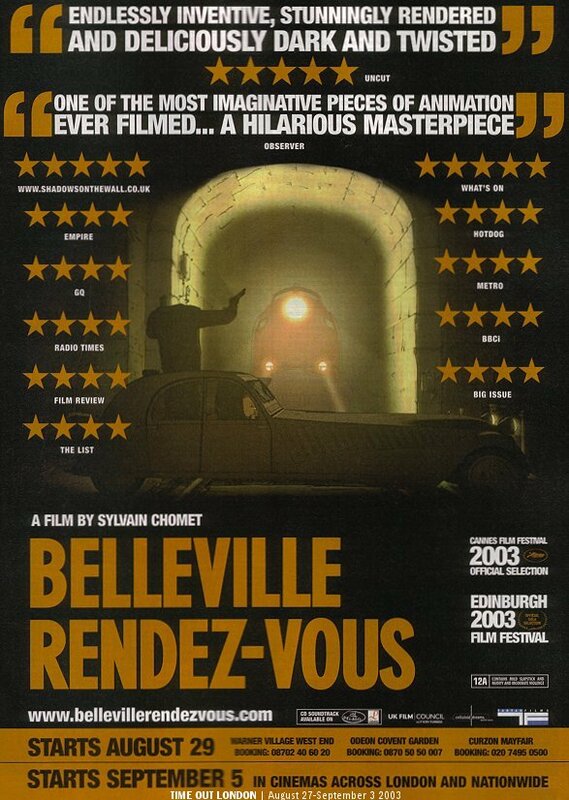 It's reminiscent of Jeunet & Caro as well as Wallace & Gromit, and the askew visual sense owes a debt to political caricature styles, while a jazzy musical score keeps our toes tapping. But more than that, this is an involving, exciting, hilarious film that we want to see again immediately after it ends. Fantastic! Swinging Belleville Rendez-vous: Madame Souza takes care of Champion after a tough day of cycling.